Earlier this week, the newly-elected Democratic Socialist Alexandria Ocasio-Cortez dropped by Rep. Nancy Pelosi's Capitol Hill office. She was not there to say hello to her new colleague but to show support for a group of environmentalists hosting a sit-in in the potential Speaker of the House's workspace. The move rankled party leadership and consultants. But what exactly was Representative-elect Ocasio-Cortez showing support for? It was the "Green New Deal", a massive overhaul spending plan of the United States' economy in an effort to supposedly combat climate change. 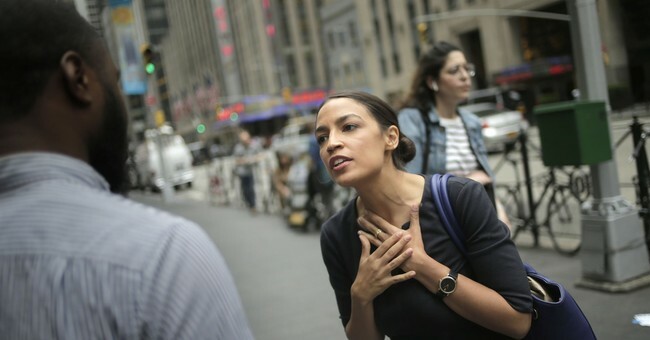 According to Politico, Ocasio-Cortez met with members from the Sunrise Movement, a nationwide coalition of young liberals concerned with climate change, in an effort to send a message to Rep. Pelosi that this was the true base of the Democratic Party. If the Democratic leaders wanted unity, they would have to listen and work with these young progressives. That solidarity is for a new resolution pushed by Representative-elect Ocasio-Cortez and other incoming Democrats. They want to force the new majority to establish a committee tasked with increasing the size of government and decreasing carbon emissions while also creating jobs for Americans. "The Green New Deal resolution calls for a bevy of far-reaching liberal goals to decarbonize the economy within a decade by reshaping the electric power, agriculture and transportation sector, but it includes few details outlining how to get there. That is likely too ambitious even for many Democrats — and would stand zero chance of getting past Senate Republicans or President Donald Trump — but the concept has become an important rallying cry for the need to address climate change. "The Green New Deal committee, meant to include six Republicans, would be charged with drafting a 10-year federal infrastructure and jobs plan to neutralize the United States’ output of greenhouse gas emissions, adopt 100 percent renewable electricity and reduce widening income inequality. The resolution would likely seek to bar lawmakers who have accepted donations from fossil fuel companies from serving." But, what about folks who have received money from 'Green Energy' companies? Well, they would be allowed to serve on the committee which would inevitably lead to crony capitalism as it does whenever Big Business cozies up Big Government. We saw this in President Barack Obama's 2009 Reinvestment Act. Green companies received billions in taxpayer dollars. And as reported by the Daily Signal in 2012, these companies often failed and their leaders pocketed the cash rather than actually create jobs and lasting green energy sources. In fact at the time of the Daily Signal article, "1,900 investigations [had] been opened to look into stimulus waste, fraud, and abuse (although not all are linked to the green-energy funds), and nearly 600 convictions have been made. Of that $80 billion in clean energy loans, grants, and tax credits, at least 10 percent has gone to companies that have since either gone bankrupt or are circling the drain." Given the fact Democratic Socialists are calling again for a massive government spending plan to promote green energy, it is safe to say President Obama's stimulus failed in this sector. But suppose a progressive is reading this, saying, "Well, we just needed more money and bigger government! Obama didn't go far enough!" Well, Australia and the United Kingdom tried their own New Green Deals, much bigger than Obama's 2009 stimulus. Guess what? A colossal mistake once again. The Washington Examiner's Tim Worstall recently explained this in a brilliant piece. The first time it was Australia. The global recession hits, so as a nice bit of Keynesian pump-priming they figured: Why not insulate the houses of the nation and thereby protect, or even limit, climate change? This plan from the central government meant that every bodger, crook, and incompetent got grants and tax money to ruin houses. They even had a Royal Commissionto tell us all what a disaster it was. It is not a usual belief that either Britain or the U.S. have fewer chancers than Australia. Despite this report, the British government decided to do the same thing. A central plan, with targets, disbursing rivers of tax money, to insulate the houses of the nation. This was then done so badly that there are fears that as many as a million houses have been ruined, and certainly thousands have been turned into entirely useful mushroom farms and not useful dwellings. And it would fail again in America if the Democratic Party ever actually passed a Green New Deal. Big Government and Big Business is a bad marriage. The lovechild of this unholy union is malfeasant products, higher prices, and reduced competition for the average American. It stinks all around and leads to crony capitalism. We call that 'crapitalism'. That is why, despite the promises of these new Democrats, Americans must reject these kinds of spending bills every chance they can.